Although most subcompact hatchbacks are pretty versatile, every now and then you run into a situation where you simply can't fit your cargo inside the vehicle. So what do you do? You put it on your roof! 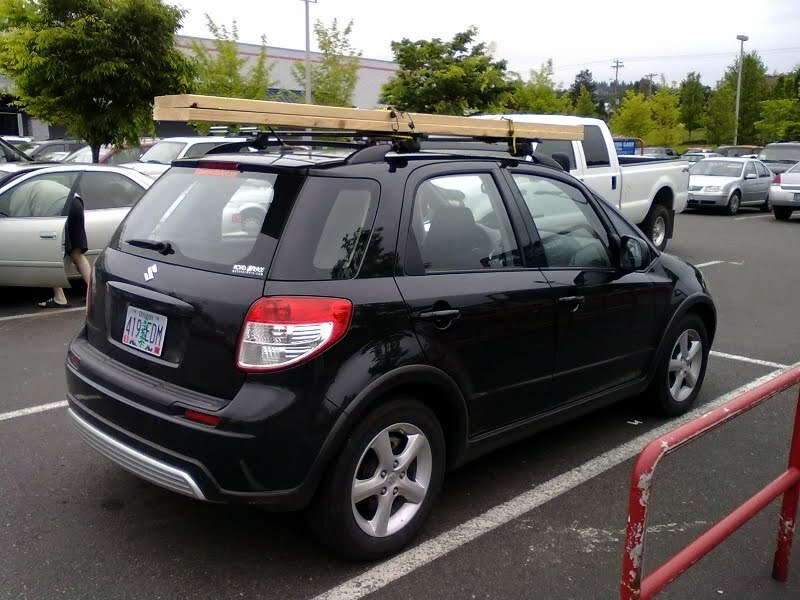 A roof rack is a great way to substantially increase your vehicle's versatility. Of course they're great for skis/snowboards, bikes, kayaks, and surfboards. However, they're also great for hauling nearly anything within the roof's (and rack's) load limits. Case in point, we hauled two 2x10x8 pieces of lumber home from Lowe's to build a raised-bed vegetable garden. Before we left, we threw on our Thule roof rack, grabbed a few bungee cords, and we were ready to transport some building supplies. No need to scratch up our interior, no need to borrow a friend's truck. With the vast array of cargo carries, rooftop baskets, and other above-vehicle accessories, a roof rack is a great thing for us small car owners! Here's a tip: Check your local area for used rack stores. I bought my Thule rack at local reseller ReRack. You'll get a great rack and save a bunch of cash. Of course, craigslist is also a great place to look, too. Is it true that roof racks will lower your MPG? Yes, having a roof rack will lower your mileage in many cases due to increased wind resistance. However, we don't keep our rack on all the time, sans the winter time, when we keep it on since we ski/snowboard so often. However, like when we went and picked up the lumber: We put it on for the job and take it off. Takes about 10 min.